Dubai, United Arab Emirates: The recently released sixth annual Cisco® Global Cloud Index (2015-2020) reveals that global cloud traffic is expected to rise 3.7-fold, up from 3.9 zettabytes (ZB) per year in 2015 to 14.1 ZB per year by 2020. In Middle East and Africa, data center traffic will reach 451 exabytes per year by 2020, up from 105 exabytes per year in 2015. This rapid growth of cloud traffic is attributed to increased migration to cloud architectures and their ability to scale quickly and efficiently support more workloads than traditional data centers. Business workloads will grow by 2.4 fold from 2015 to 2020 but their overall share of data center workloads will decrease from 79 to 72 percent. Consumer workloads, while smaller in number, are growing faster: During the same time, consumer workloads will grow faster by 3.5 fold. By 2020, consumer workloads will account for 28 percent (134.3 million) of total data center workloads, compared to 21 percent (38.6 million) in 2015. By 2020, video streaming workloads will account for 34 percent of total consumer workloads, compared to 29 percent in 2015. By 2020, social networking workloads will account for 24 percent of total consumer workloads, compared to 20 percent in 2015. IoT/analytics/database workloads are growing the most in terms of share of business workloads with collaboration and compute workloads largely maintaining their share. Video and social networking will lead the increase in consumer workloads, each respectively grows their percentage significantly. By 2020: video streaming workloads will account for 34 percent of total consumer workloads, compared to 29 percent in 2015; social networking workloads will account for 24 percent of total consumer workloads, compared to 20 percent in 2015; search workloads will account for 15 percent of total consumer workloads, compared to 17 percent in 2015. “Although our region has made significant strides to reach a capable level of supporting basic and intermediate cloud services, the focus now turns to continuing to improve network capabilities to support the advanced cloud applications that organizations and end users expect and rely upon,” added Weston. For the first time, Cisco also quantified and analyzed the impact of hyperscale data centers. 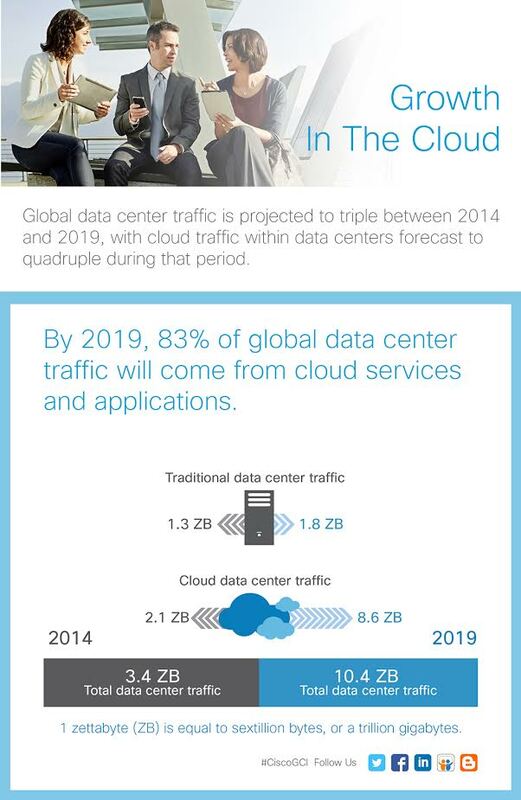 These data centers are expected to grow from 259 in 2015 to 485 by 2020. Hyperscale data center traffic is projected to quintuple over the next five years. These infrastructures will account for 47 percent of total data center installed servers and support 53 percent of all data center traffic by 2020. A key infrastructure trend is transforming hyperscale (and other) data centers. Software-defined networking (SDN) and network functions virtualization (NFV) are helping to flatten data center architectures and streamline traffic flows. Over the next five years, nearly 60 percent of global hyperscale data centers are expected to deploy SDN/NFV solutions. By 2020, 44 percent of traffic within data centers will be supported by SDN/NFV platforms (up from 23 percent in 2015) as operators strive for greater efficiencies. In Middle East and Africa, data center traffic will reach 451 Exabytes per year by 2020, up from 105 Exabytes per year in 2015. In Middle East and Africa, data center traffic will grow 4.3-fold by 2020, at a CAGR of 34% from 2015 to 2020. In Middle East and Africa, data center traffic grew 53% in 2015, up from 69 Exabytes per year (5.7 Exabytes per month) in 2014. In Middle East and Africa, 65.0% of data center traffic will remain within the data center by 2020, compared to 73.7% in 2015. In Middle East and Africa, consumer data center traffic will represent 74% of total data center traffic by 2020, compared to 37% in 2015. In Middle East and Africa, cloud data center traffic will represent 67% of total data center traffic by 2020, compared to 66% in 2015. In Middle East and Africa, cloud data center traffic will reach 304 Exabytes per year (25 Exabytes per month) by 2020, up from 69 Exabytes per year (5.8 Exabytes per month) in 2015. In Middle East and Africa, cloud data center traffic will grow 4.4-fold by 2020, at a CAGR of 34% from 2015 to 2020. In Middle East and Africa, cloud data center traffic grew 63% in 2015, up from 43 Exabytes per year (3.5 Exabytes per month) in 2014. In Middle East and Africa, consumer will represent 68% of cloud data center traffic by 2020, compared to 33% in 2015. In Middle East and Africa, traditional data center traffic will represent 33% of total data center traffic by 2020, compared to 34% in 2015. In Middle East and Africa, traditional data center traffic will reach 147 Exabytes per year (12 Exabytes per month) by 2020, up from 36 Exabytes per year (3.0 Exabytes per month) in 2015. In Middle East and Africa, traditional data center traffic will grow 4.1-fold by 2020, at a CAGR of 32% from 2015 to 2020. In Middle East and Africa, traditional data center traffic grew 38% in 2015, up from 26 Exabytes per year (2.2 Exabytes per month) in 2014. In Middle East and Africa, consumer will represent 89% of traditional data center traffic by 2020, compared to 46% in 2015. The Cisco® Global Cloud Index (2015-2020) was developed to estimate global data center and cloud-based traffic growth and trends. The report serves as a complementary resource to existing Internet Protocol (IP) network traffic studies such as the Cisco Visual Networking Index™, providing new insights and visibility into emerging trends affecting data centers and cloud architectures. The forecast becomes increasingly important as the network and data center become more intrinsically linked in offering cloud services.